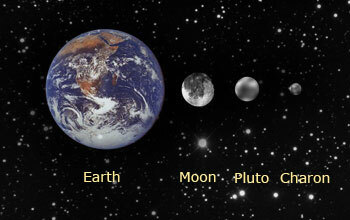 Dwarf planets are the ones which are very small to be considered as planets. Recently there was lot of discussion on the planet Pluto, for assigning a status of a dwarf planet. The ninth planet of the solar system, Pluto, was classified as "dwarf planet" along with four other bodies (Eris, Ceres, Makemake and Haumea) which are smaller than the Earth's moon. This Pluto is the second largest Dwarf Planet. Volume of Pluto is one&dash;third of the volume of the Earth's moon and its mass is only one&dash;sixth when compared to the Earth's moon. The radio waves traveling with the speed of light could take approximately 4 hours to reach the Pluto when sent from Earth and it would take the same time to reach back. Of all the planets and moons in the solar system, Pluto and Charon are the two which resemble each other the most closely. See figure. Known Dwarf Planets The first five recognized dwarf planets are Ceres, Pluto, Eris, Makemake and Haumea. 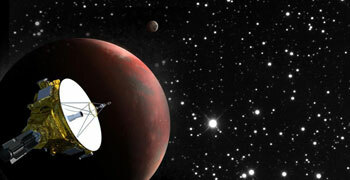 Scientists believe there may be dozens or even more than 100 dwarf planets awaiting discovery. What are the known dwarf planets? Eris: This is the largest dwarf planet, which is only slightly bigger than Pluto, The diameter of Eris is 2,326 kms. This was discovered in the year 2003. The average distance of the Eris orbit is 68 times the Earth’s distance from the sun and it takes 561.4 Earth years to orbit the sun. The duration of the day on Eris is 1.9 hours more than that of the Earth. This dwarf planet Eris has Dysnomia, as its only moon. Pluto: This dwarf planet was discovered in 1930. The average distance of Pluto's orbit is nearly 40 times that of the Earth's distance from the Sun. It takes 248 (approximately) Earth years to orbit the Sun completely. 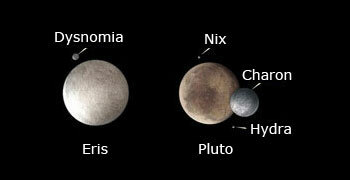 This dwarf planet has five known moons: Charon, Nix, Hydra and two more were recently discovered which are not named yet. This dwarf planet revolves around the sun in an elliptical orbit which is at an angle of 17o with the plane of other planets. Makemake is a dwarf planet that orbits the sun inside the Kuiper Belt on the edge of the solar system. 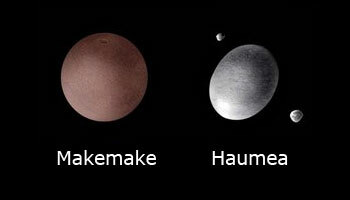 Haumea is a dwarf planet that orbits the sun inside the debris field at the edge of the solar system known as the Kuiper Belt. This dwarf planet was discovered in the year 2005. The average distance between the Sun and this is 45.3 times the distance between the Sun and the Earth. It takes more than 305 years to complete one orbit around the Sun. The duration of the day is 22.5 hours. It has no moons identified till date. This dwarf planet was discovered in the year 2003. It has an elongated shape and rotates very fast. It has the shortest day of 3.9 hours, which is too short when compared to other dwarf planets. It takes around 282 Earth years to complete one orbit around the Sun. The average distance between Sun and Haumea is 43.1 times the distance between the Sun and the Earth. It has two moons, namely Hi’iaka and Namaka. Ceres appears to be differentiated into a rocky core and icy mantle, and may harbor an ocean of liquid water under its surface. The surface is probably a mixture of water ice and various hydrated minerals such as carbonates and clay. Ceres is the first observed dwarf planet by astronomers in the year 1801. It was first called a planet and later an asteroid. In the year 2006 it was reclassified as a dwarf planet. Ceres is the closest dwarf planet to Earth. The planet's average distance from the Sun is 2.8 times the distance between Earth and Sun. It takes 4.6 Earth years to complete one orbit around the Sun. The duration of the day is around 9.1 hours. This too has no moons identified till date. Scientists and astronomers estimate that there could be more than 200 dwarf planets in the solar system and Kuiper Belt. But the differences between planets and dwarf planets may not be obvious during the first observation. Icy geysers found by HST Geysers of liquid water and ammonia are erupting on Pluto's large moon Charon, new observations suggest. The work bolsters the idea that Charon may harbor a liquid ocean beneath its surface - and just possibly, life! What is mysterious about Pluto? Pluto is the resident of Kupier belt. 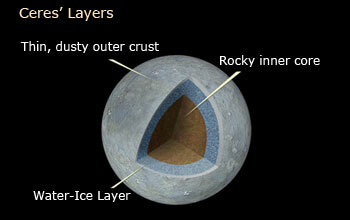 Researchers say that they could find icy geysers as per the images sent by Hubble Space Telescope. There could be a finite probability of finding few deposits of organic material. Its atmosphere has traces of carbon monoxide, along with nitrogen and methane, as observed from images taken by the HST. The temperature on the surface of the Pluto is around -228o C to -238o C.
NASA Launched a high speed space craft ever “New Horizons” in Jan, 2006 to study the dwarf planet Pluto and it would reach Pluto by July, 2015. The latest news about New Horizons says that it had crossed the planet Jupiter. New Horizons Spacecraft Destination Pluto is a journey of discovery for space travelers of all ages. Destination Pluto examines the wonders of the Sun's system, reviews the recent change in our understanding of how Pluto differs from the other planets. No space craft could reach Pluto, till date. The New Horizons Space craft would reveal more about the Pluto's inner composition and search for more moons. As the New Horizons passed through Jupiter it revealed many images that showed the Jupiter, Uranus and Neptune with rings around them filled with gas and dust. The researchers predict that there could be rings around the new dwarf Pluto. Only the New Horizons could unseal the mystery. New Horizons may discover the atmosphere on Pluto and Charon and also other binary planets (a planet and its moon of similar size like Pluto and Charon), during its journey towards the dwarf planet Pluto. Despite the fact that Pluto and Neptune temporarily change places in their distance from the Sun, they will never collide. Will Pluto Ever Hit Neptune? The Pluto is no more a Planet. It had lost its status as a Planet since it was observed that it was intersecting the orbit of Neptune. Immediate question arrives that is: Is there any chance of collision between Neptune and Pluto at the time of intersection? The two planets are said to have enough space between them (approximately 2 billion kilometers), even though their orbits cross each other at an angle, on two different planes. For every three orbits of Neptune, Pluto completes two orbits. So they are said to be in stable orbits.